A simple new beginning. – That's StitchTastic! Dear Knitting friends. It has been a while since I have gotten to chat with you. I have taken this past year and a half off from blogging, because, well, it was just too much. I started my little blog with the intent of helping others learn to knit, and to share all kinds of things within the stitching world. But I wasn’t aware of the pressure that comes with having a quality blog, trying to get and retain blog traffic, and all the other social media it entailed. I felt like I had to be some one I wasn’t. My blog posts started to feel “fake” and not like the real me. It became a bad fit for my family’s season of life and I backed away. This past year or so has been a whirlwind. My husband is almost finished with 2 degrees (1 more semester! I am so excited). I have had to return back to work full time. Plus we home educate. I have not gotten as much knitting done as I had wished. And the knitting lessons have become sporadic. I have not gotten to join in many local knitting or spinning guild meetings. But. This season of life is drawing to a end. And it is time I begin again to further my interests. So here I am. 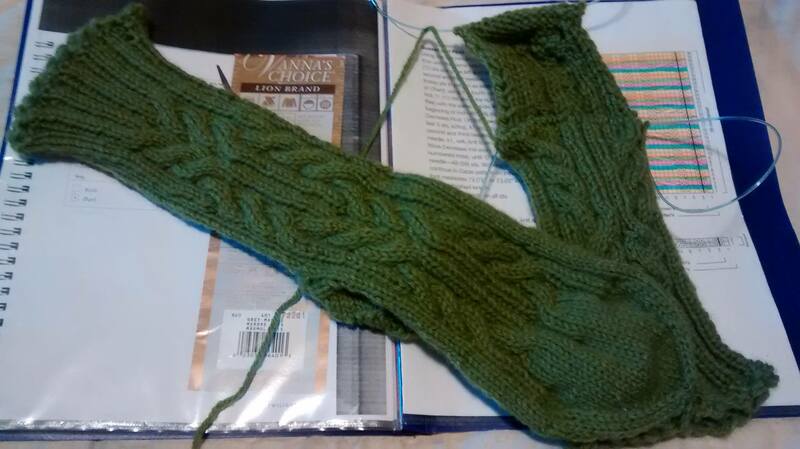 How I have missed getting to blog about my knitting via blogosphere. I have kept up with a few of my fiber friends via FB. I have made new fiber friends. And I am excited to get to share my knitting and some of my real life with you all. And so you know. I have to keep my real life priority. As much as I would love to have an eye pleasing blog with graphics I could spend hours on…… as much as I would love to have well thought out blog posts, with a draft and re-drafts. It just is not going to happen. At least not for a while. These blog posts are going to be simply chit chat over a cup of coffee. I’ll probably have just the time it takes for my cup of coffee to cool. Because that is about how long my youngest will stay in bed for quiet time. The pictures are not going to be the best… I do have a nice camera and will use it when I can…. but I know nothing about editing photos. My home is not going to be the cleanest, and if you happen to see a little clutter in the background… well sorry. I haven’t been able to afford a housekeeper just yet. I will aim to have one nice blog post a week focusing on teaching others. I am also going to try to add to my video library once a week. I am working hard to get back into teaching knitting. I know it will take some time to rebuild my client base. But I also know there are others I can’t reach in person who also need help. I want this blog to be a resource free resource for them. Free. As time goes by this blog will change with the ebb and flow of the times. I will learn slowly and improve my blog one small step at a time. Pictures will get better. Formatting and editing will fit into my time schedule. But one thing that will not change, is that this little blog will be exactly what I want it to be. I miss the days of the first decade of this century where a blog was a platform for a conversation. A true conversation. Where you, me, and other knitters could simply sit down with a cup of coffee and read about each other’s experiences in our knitting life. And knitting became a common thread that stitched distant lives together into close friendships. I am not going to try to win any blog awards or any personality contests. There are a lot of blogs on the web. And I don’t want to add to the noise unnecessarily. I’m simply going to write about knitting and all things related to stitchery, with a bit of real life thrown in. That just makes the best sense to me. So if you happen to stop by. Pull up a chair. Pour yourself a cup of coffee or hot cocoa. And say hello! Log Cabin Socks. I’m knitting these for my FIL for a late Christmas present. I knit my MIL a matching pair in blue. I’m almost done with the 2nd sock. It is just lacking the toe, grafting, and weaving in the ends. Twilight Socks – These are a gift for my sister in law. She became a new mommy a few weeks ago, and I wanted to make something to pamper her. Yggdrasil – This one is for my In Law’s 40th anniversary this next fall. I will be casting it on as soon as I finish the Log Cabin socks, and I hope to have it finished before the summer heat arrives. Finished Project – Log Cabin Socks. I 100% understand what you mean about all the work of blogging! There’s so much more I could do, but I feel kind of “eh” about it so I let myself be lazy in some areas. ;-D First and foremost it should be a true expression of you! I am so happy to see you join in on the love your library project! Thanks Emily! I look forward to it too!